Numbers and arithmetic operations are built-in data and functions. Now we will learn about function definitions, a much more powerful abstraction technique by which a name can be bound to compound operation, which can then be referred to as a unit. which defines a new function that has been given the name square. This user-defined function is not built into the interpreter. It represents the compound operation of multiplying something by itself. The x in this definition is called a formal parameter, which provides a name for the thing to be multiplied. The definition creates this user-defined function and associates it with the name square. Function definitions consist of a def statement that indicates a &lt;name&gt; and a list of named &lt;formal parameters&gt;, then a return statement, called the function body, that specifies the &lt;return expression&gt; of the function, which is an expression to be evaluated whenever the function is applied. Our subset of Python is now complex enough that the meaning of programs is non-obvious. What if a formal parameter has the same name as a built-in function? Can two functions share names without confusion? To resolve such questions, we must describe environments in more detail. An environment in which an expression is evaluated consists of a sequence of frames, depicted as boxes. Each frame contains bindings, which associate a name with its corresponding value. There is a single global frame that contains name bindings for all built-in functions (only abs and max are shown). We indicate the global frame with a globe symbol. Assignment and import statements add entries to the first frame of the current environment. So far, our environment consists only of the global frame. The name max is the intrinsic name of the function, and that&apos;s what you see printed as the value for f. In addition, both the names max and f are bound to that same function in the global environment. As we proceed to introduce additional features of Python, we will have to extend these diagrams. Every time we do, we will list the new features that our diagrams can express. New environment Features: Assignment and user-defined function definition. To evaluate a call expression whose operator names a user-defined function, the Python interpreter follows a process similar to the one for evaluating expressions with a built-in operator function. That is, the interpreter evaluates the operand expressions, and then applies the named function to the resulting arguments. Bind the arguments to the names of the function&apos;s formal parameters in a new local frame. Evaluate the body of the function in the environment beginning at that frame and ending at the global frame. The environment in which the body is evaluated consists of two frames: first the local frame that contains argument bindings, then the global frame that contains everything else. Each instance of a function application has its own independent local frame. This figure includes two different aspects of the Python interpreter: the current environment, and a part of the expression tree related to the current line of code being evaluated. 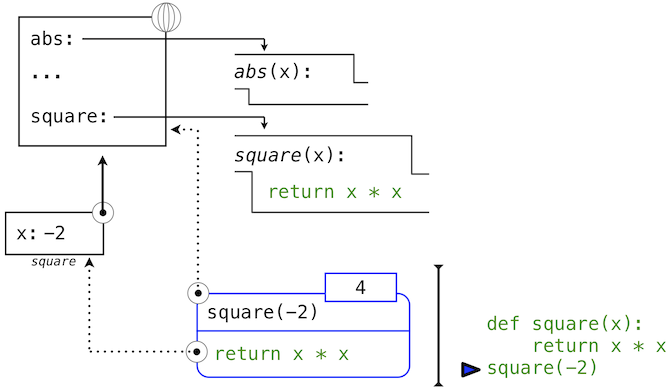 We have depicted the evaluation of a call expression that has a user-defined function (in blue) as a two-part rounded rectangle. Dotted arrows indicate which environment is used to evaluate the expression in each part. The top half shows the call expression being evaluated. This call expression is not internal to any function, so it is evaluated in the global environment. Thus, any names within it (such as square) are looked up in the global frame. The bottom half shows the body of the square function. Its return expression is evaluated in the new environment introduced by step 1 above, which binds the name of square&apos;s formal parameter x to the value of its argument, -2. A name evaluates to the value bound to that name in the earliest frame of the current environment in which that name is found. Our conceptual framework of environments, names, and functions constitutes a model of evaluation; while some mechanical details are still unspecified (e.g., how a binding is implemented), our model does precisely and correctly describe how the interpreter evaluates call expressions. In Chapter 3 we shall see how this model can serve as a blueprint for implementing a working interpreter for a programming language. New environment Feature: Function application. Python first evaluates the name sum_squares, which is bound to a user-defined function in the global frame. The primitive numeric expressions 5 and 12 evaluate to the numbers they represent. Next, Python applies sum_squares, which introduces a local frame that binds x to 5 and y to 12. In this diagram, the local frame points to its successor, the global frame. All local frames must point to a predecessor, and these links define the sequence of frames that is the current environment. "operator"   "operand 0"   "operand 1"
All three subexpressions are evalauted in the current environment, which begins with the frame labeled sum_squares. The operator subexpression add is a name found in the global frame, bound to the built-in function for addition. The two operand subexpressions must be evaluated in turn, before addition is applied. Both operands are evaluated in the current environment beginning with the frame labeled sum_squares. In the following environment diagrams, we will call this frame A and replace arrows pointing to this frame with the label A as well. 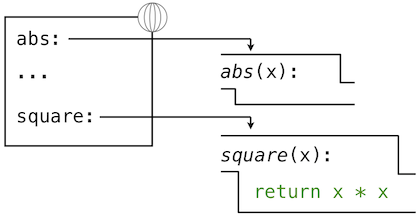 In operand 0, square names a user-defined function in the global frame, while x names the number 5 in the local frame. Python applies square to 5 by introducing yet another local frame that binds x to 5. Using this local frame, the body expression mul(x, x) evaluates to 25. Our evaluation procedure now turns to operand 1, for which y names the number 12. 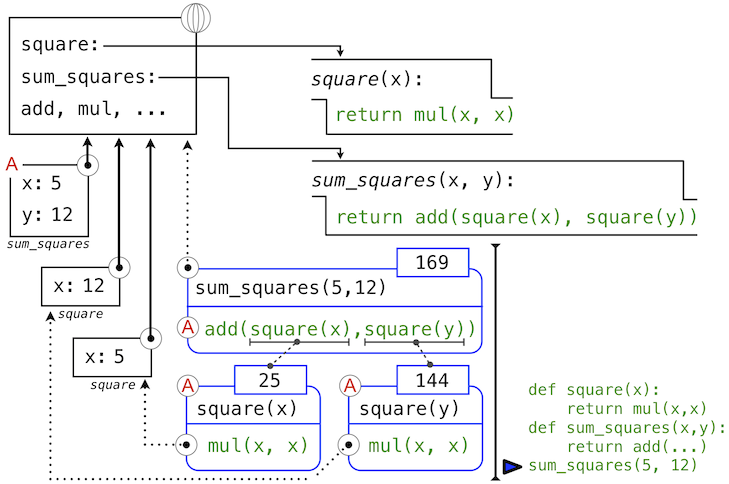 Python evaluates the body of square again, this time introducing yet another local environment frame that binds x to 12. Hence, operand 1 evaluates to 144. Finally, applying addition to the arguments 25 and 144 yields a final value for the body of sum_squares: 169. This figure, while complex, serves to illustrate many of the fundamental ideas we have developed so far. Names are bound to values, which spread across many local frames that all precede a single global frame that contains shared names. 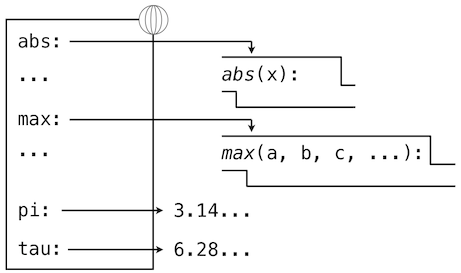 Expressions are tree-structured, and the environment must be augmented each time a subexpression contains a call to a user-defined function. All of this machinery exists to ensure that names resolve to the correct values at the correct points in the expression tree. This example illustrates why our model requires the complexity that we have introduced. All three local frames contain a binding for the name x, but that name is bound to different values in different frames. Local frames keep these names separate. This principle -- that the meaning of a function should be independent of the parameter names chosen by its author -- has important consequences for programming languages. The simplest consequence is that the parameter names of a function must remain local to the body of the function. If the parameters were not local to the bodies of their respective functions, then the parameter x in square could be confused with the parameter x in sum_squares. Critically, this is not the case: the binding for x in different local frames are unrelated. Our model of computation is carefully designed to ensure this independence. We say that the scope of a local name is limited to the body of the user-defined function that defines it. When a name is no longer accessible, it is out of scope. This scoping behavior isn&apos;t a new fact about our model; it is a consequence of the way environments work. The interchangeabily of names does not imply that formal parameter names do not matter at all. To the contrary, well-chosen function and parameter names are essential for the human interpretability of function definitions! The following guidelines are adapted from the style guide for Python code, which serves as a guide for all (non-rebellious) Python programmers. A shared set of conventions smooths communication among members of a programming community. As a side effect of following these conventions, you will find that your code becomes more internally consistent. Function names should be lowercase, with words separated by underscores. Descriptive names are encouraged. Parameter names should be lowercase, with words separated by underscores. Single-word names are preferred. Parameter names should evoke the role of the parameter in the function, not just the type of value that is allowed. Single letter parameter names are acceptable when their role is obvious, but never use "l" (lowercase ell), "O" (capital oh), or "I" (capital i) to avoid confusion with numerals. Review these guidelines periodically as you write programs, and soon your names will be delightfully Pythonic. 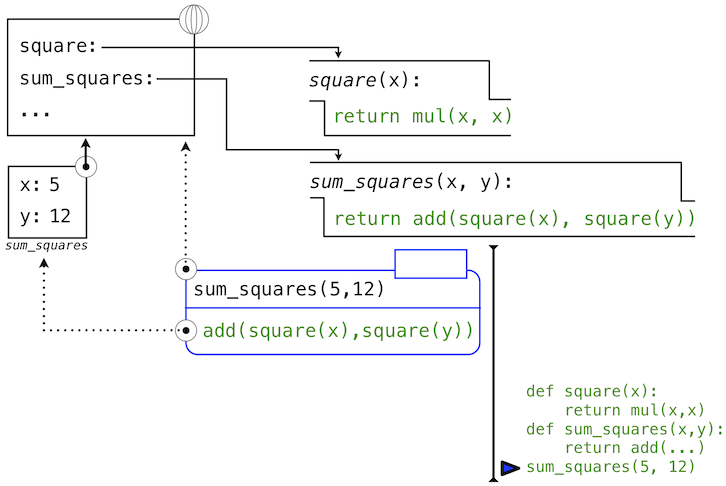 Though it is very simple, sum_squares exemplifies the most powerful property of user-defined functions. 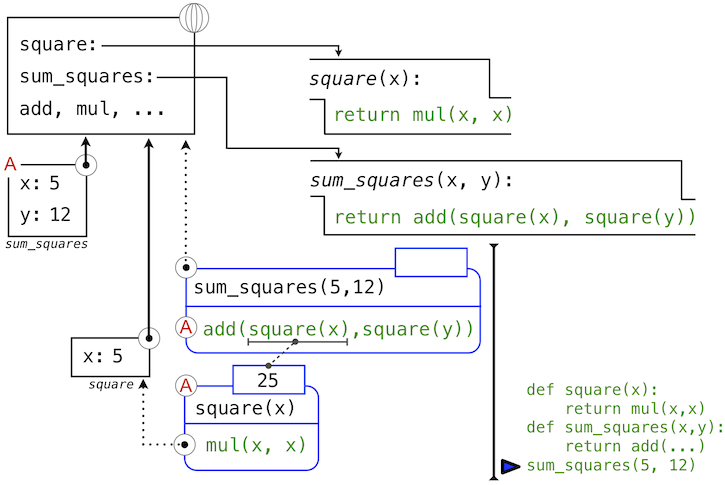 The function sum_squares is defined in terms of the function square, but relies only on the relationship that square defines between its input arguments and its output values. We can write sum_squares without concerning ourselves with how to square a number. The details of how the square is computed can be suppressed, to be considered at a later time. Indeed, as far as sum_squares is concerned, square is not a particular function body, but rather an abstraction of a function, a so-called functional abstraction. At this level of abstraction, any function that computes the square is equally good. In other words, a function definition should be able to suppress details. The users of the function may not have written the function themselves, but may have obtained it from another programmer as a "black box". A user should not need to know how the function is implemented in order to use it. The Python Library has this property. Many developers use the functions defined there, but few ever inspect their implementation. In fact, many implementations of Python Library functions are not written in Python at all, but instead in the C language. Mathematical operators (like + and -) provided our first example of a method of combination, but we have yet to define an evaluation procedure for expressions that contain these operators. Infix notation can be nested, just like call expressions. Python applies the normal mathematical rules of operator precedence, which dictate how to interpret a compound expression with multiple operators. The nesting in the call expression is more explicit than the operator version. Python also allows subexpression grouping with parentheses, to override the normal precedence rules or make the nested structure of an expression more explicit. You should feel free to use these operators and parentheses in your programs. Idiomatic Python prefers operators over call expressions for simple mathematical operations.